Clark Bradshaw's R/M Babylon 5 Station decals. 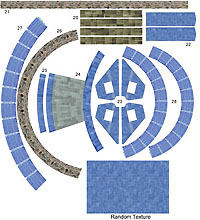 Clark created decals of supplemental lights and markings for the R/M Babylon 5 Station kit. The sheet includes extra detail for many of the parts left untouched by the original decal sheet. He has kindly granted permission for readers to download this artwork for personal use only. Any other use (i.e. selling decal sheets containing these images) will cause this page to be shut down. The decals are in .jpg format at 300 ppi. A placement guide is also includedAll files were zipped using Wn_Zip 6.0 for Windows. Download Decals (1.5Mb): Two files in .jpg format, decals (1.6Mb) and placement guide (95kb). This page copyright © 1997-2001 Starship Modeler. Last updated on 3 August 2001.